Treat.com has a card for everyone. I was able to find the PERFECT cards for each one of my girls. Then I let the girls create some cards for the special people in thier lives. 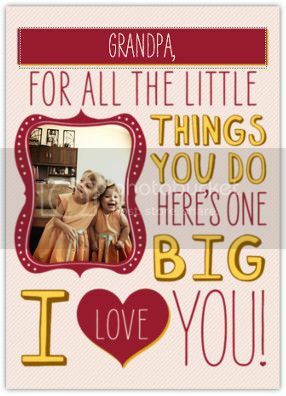 The first card I created was for my oldest. When she was a baby she used to hold her bottle with her feet. Because of this I started calling her my little monkey and the nickname has stuck with her to this day. So when I saw this card, I knew that it was the perfect one for her. The next card is for my youngest. 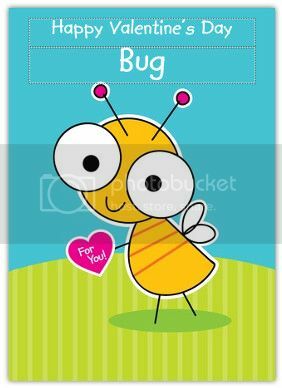 This adorable little bug card fits her perfectly because she is my little Cuddle Bug. 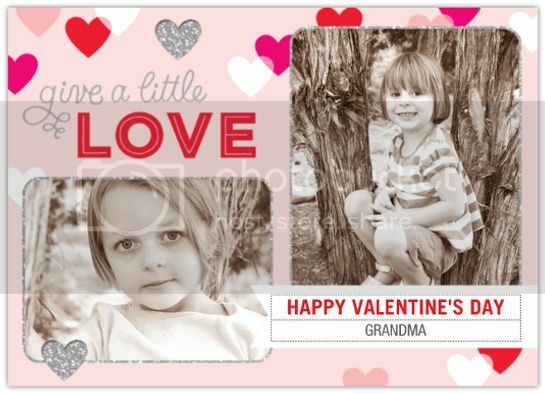 This is the card that the girls picked out for their Grandma. I choose to use the sepia mode (which you can do on treat so no need to edit the photos before hand.) and I love how the card turned out. And this is what they picked for Grandpa. The best part about Treat.com is the editing and personalization options. You can edit most of the text to say whatever you want. If you can't think of what to say, they have a few samples that you can choose from. 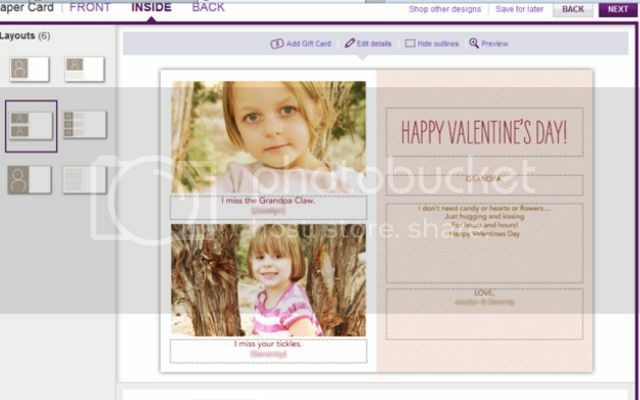 When you click on the inside view of the card you will find a few different layout options. (on the left hand side of the photo above) This allows you to add more photos (with or without captions) or you can just add more text such as a special saying or poem that you would like to include. There is also an option to include a gift card as well. The Treat is an easy and convenient solution for being more thoughtful. You can create your card anytime, anywhere and their mailing service can mail it for you. Treat offers a reminder service so you don’t forget important occasions and you are able to add a personalized photo gift or a gift card to any greeting card. 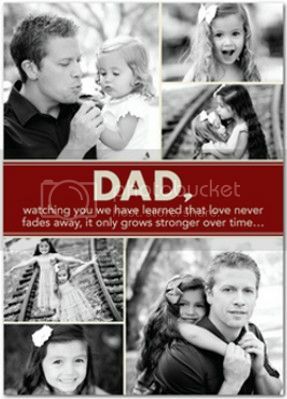 And for those of you who would rather send a gift than a card, Treat also has many Photo Gifts to choose from. Offer expires 2/28/2014 at 11:59 pm (PT). 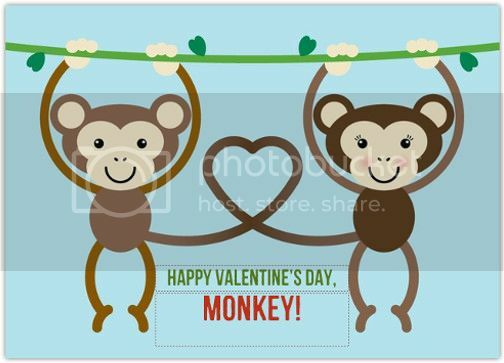 Enjoy three (3) greeting cards for $6 using code SENDMORELOVE at checkout. Customer must be a first-time Treat customer and credit card information is required for validation. Postage and tax may apply. This offer is valid for one transaction only and any quantity not used in the transaction will be forfeited. Offer applies exclusively to greeting cards and is not applicable to gifts, gift cards, Treat Card Club packs, previously placed orders, taxes or postage fees. Offer is only valid on treat.com and cannot be used on the Treat Cards for iPhone app or partner websites. To prevent fraud or abuse, we reserve the right to discontinue or modify this offer or cancel any order. Be sure to visit Treat.com. Explore the site and #SendMoreLove this Valentine’s Day. Which of your loved ones deserve a card?